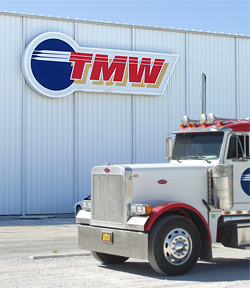 For the convenience of our customers and their drivers, material pickup at TMW operates on a first-come/first-serve basis. To arrange for pickup, contact your TMW Account Executive during normal office hours and give them the details of what you would like on the load. Please allow a minimum of 2 hours to prepare shipping paperwork and stage the material to be loaded. When you contact your Account Executive, they will give you a 6-digit release number. Please note that each truckload will need its own number and that loading cannot proceed without the assigned release number. We appreciate your business and your cooperation with this system. Please let us know if you have any questions or encounter any problems. From St. Louis Airport, take I-70 East approximately 15 miles. The road dips in downtown St. Louis by the Gateway Arch. Go into the right lane and take Exit Illinois North East 55/70. You will cross the Poplar Street Bridge (Dickman Bridge). Move to the right lane on the bridge and take Exit Cahokia Route 3 South. Continue on Route 3 South through Sauget/Cahokia to I-255 South. Continue on I-255 South to Exit 6 - Route 3 Columbia. Stay on Route 3 South through Waterloo and into Red Bud. Before coming to the flashing 4 way stop in Red Bud, immediately park as soon as possible on the right side of East Market across from The First National Bank. Our office is located directly on the corner. Once parked, walk around the corner to the entrance to TMW. 4-way stop in the center of Red Bud, take Route 154 East seven miles. Just prior to crossing Kaskaskia River, TMW is located on the right. 4-way stop in the center of Red Bud, take Route 154 East one mile. Turn left onto B&E Industrial Drive. TMW is on the right just past the Red Bud Industries building. Copyright © 2004–2017 The Material Works, Ltd. All Rights Reserved. Web Site by Mercury Business Development Services.